(Translated by Google) Sublime chalet super well appointed, very cozy, well located. Ideal for a family with children or with the whole family! (Original) Sublieme chalet super goed ingericht, heel gezellig, goed gelegen. Ideaal voor een gezin met kinderen of met de hele familie! We had a fab weather for skiing/walks! 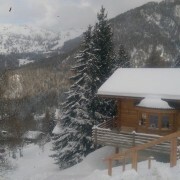 We all loved the chalet, very beautiful with wonderful views. Sauna and jacuzzi were a great bonus to relax after mountains. This is a place to truly switch off from your busy life and go into this luxurious chalet in a stunning setting. We had a great time and the owners were great from the beginning. 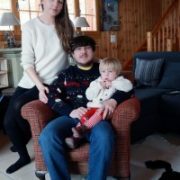 We stayed in the chalet during spring/ summer for 10 nights. 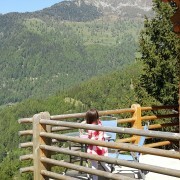 The views from the chalet were incredible!! We used the chalet as a base for mountain biking and hiking. 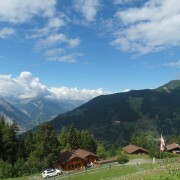 There was fantastic mountain biking and road biking routes with Verbier easily accessible by car or mountain bike. The village was very tranquil which was exactly what we were looking for. The Jacuzzi and sauna were brand new and the chalet being located over 3 floors felt huge for our family. 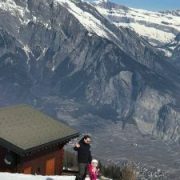 The chalet was well maintained and looked like all the bathrooms had been modernised recently. 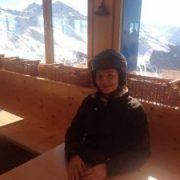 I would recommend this chalet for sure and we will be visiting again in the near future! 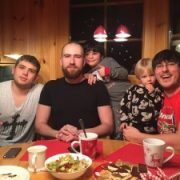 Our family had a great time in Chalet Teremok in Jan 2017. We would like to thank the owners of the chalet who gave us the opportunity to spend our winter holidays in their chalet. There are a few things which I would like to highlight. Hopefully, you will find my feedback helpful. The chalet has a beautiful design and decoration. It has been recently renovated. Moreover, the attention to details of the chalets’ owners is amazing. There is everything what you need and even more for your comfortable stay. We like cooking. There is a very good shop in the centre of the village with a great meet, cheese, etc. Again, there is everything what you need to enjoy cooking in the chalet – grill, pans, fondue pan, etc. If you do not like cooking there is an opportunity to order catering. There is a good chef who lives close. We ordered a cake and it was delicious. There are a few restaurants where you can have drinks and dinner in the village. Please note that La tzoumaz is not probably the place to dress up. The restaurants are average level, and the choice of them is limited. Please also note that it is quite difficult to travel to another village in the evening. La Tzoumaz is a small resort, but a special one. As you can ski here and ski in Verbier as well. So we had our lunches mostly in Verbier and there are many great restaurants there. So we can say that we enjoyed all the 4 valleys resorts by not at a huge cost. The last but not the least, it is very easy to get to the slopes. 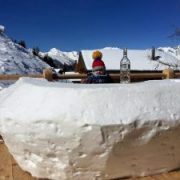 The bus station is very close to the chalet and there is just one stop to the slope or to the main telecabine. All in all, we would recommend to stay in this Chalet. We had a great time! We spent a wonderful week at this fantastic chalet. The description corresponds to the facts, everything is as pictured in the photos. The chalet is very tasteful, high quality, modern and lovingly furnished. Thanks to the large windows, the rooms are flooded with light, with a spectacular view of the Alps. Everything is very clean and well maintained. The spa is a real dream, thanks to the large panoramic windows you can even enjoy the view of the mountains from the jacuzzi and the sauna. Or in the evening beside the crackling fireplace fire and a good glass of wine enjoy the sunset …. what a dream! It also has Wifi, Netflix, Sat.TV and comfortable sofas. The beds and mattresses are of good quality, every bedroom is very nice and individually decorated. The location is central and quiet. We did not ski, but enjoyed beautiful walks with our dog. 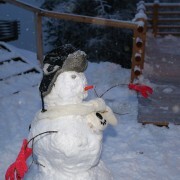 The chalet and La Tzoumaz are recommended even if you do not want to ski. 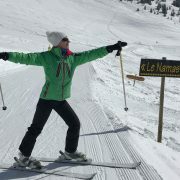 (For skiers: La Tzoumaz belongs to the fantastic ski area “Les 4 Vallées”). The week has unfortunately passed much too fast. We will recommend the chalet to our friends. “The chalet with its facilities definitively made a difference to our stay and exceeded expectations. The chalet had everything and more we needed. It has fantastic layout, all clean and tastefully arranged, all felt like in Switzerland, brand new, neat and tidy. The open space, sofas, big table and really well equipped kitchen will work for any party. We enjoyed hanging out together in the open space as well as in the fabulous spotless spa ideal after skiing heaps of kilometres. What I liked was opening the big window and sit in the jacuzzi as if it was outside. We had plenty snow so jumping out from sauna straight into snow was great. And on top of that these fantastic views! Thanks to Dan (Chalet Teremok’s managing agent) for being a great host. Definitively would recommend. The Chalet is quite spectacular! Wood panelled and beautifully furnished inside, it captures the feeling of a true Alpine skiing holiday. Even though it is very spacious it has that important cozy feeling that sets places apart. 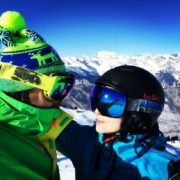 It is very family friendly and convenient (fully equipped kitchen, impeccably clean, crisp clean linen and all the skiing related paraphernalia you need – think drying room and hooks for wet boots and gloves, shelves for helmets etc etc). After a hard day of skiing, the sauna and jacuzzi provided that soothing luxury that is so appreciated whilst looking out onto the snow covered slopes. The living area has an amazing authentic fireplace and large windowed doors to draw in the light. 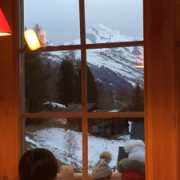 Near the gondola there is a wonderful crèche nearby where we left our toddler while skiing as well as ski school 5 mins away for older kids (3/4+). 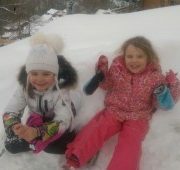 “We stayed in Chalet Teremok in Jan 16 with both children and grandparents and all absolutely loved it. Teremok is a great cosy place to spend your holidays with your family. It is recently built with full array of modern facilities, but at the same time has that alpine feeling to it that you want from a chalet. La Tzoumaz is quite a small village, but there is everything you might need within a 30 min drive. Skiing was perfect!!! Many quality nearby options within an easy reach. Sauna and a hot tub after a day on the mountain were ideal. 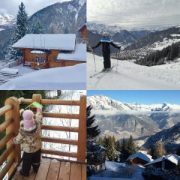 “Thank you for our wonderful stay at Chalet Teremok – we had a fantastic week. The chalet is so comfortable and homely and the attention to detail is really special. All the bedrooms are comfortable and beautifully styled. The spa is awesome – what is more relaxing than a jacuzzi overlooking the mountains after a long day of skiing?! “Absolutely superb chalet! The chalet is finished to a very high specification throughout. It is beautifully warm and cosy but also very spacious. In the heart of the 4 vallées we found great skiing for all levels. You can ski into Verbier in about 10-15 minutes from the main lifts in La Tzoumaz. La Tzoumaz is smaller than some other resorts but has everything you could want – ski school, crèche, swimming pool. 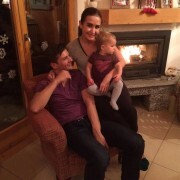 “We stayed in La Tzoumaz in December 2014. The house is just perfect for a family! The two rooms that face each-other with the bathroom in the middle give just the right independence to kids and parents. The kitchen has everything you might ever want or need. The local shops are near and sell good quality food.